First, let me apologize for my long break from blogging! I wanted to take time to process my time in Israel, and May has been quite a whirlwind for me, as the day before I left on my trip to Israel and Portugal, I had a huge event at the George Bush Presidential Center. It was a very big deal for me because my CEO was coming into town to speak and I wanted to make sure everything was absolutely perfect. Thankfully, almost everything went as planned and the event was a huge success! As soon as everyone walked out of the Bush Center, I could breath again, and it finally hit me that I would be traveling solo for two weeks. For some reason, and I’m not completely sure why, a couple of weeks before my trip I began to feel very lonely. Don’t get me wrong, I’ve been going out a lot, working out, busy with work, and incredibly excited about my trip, but on the other hand, I was worried how I would feel traveling across the world by myself. And while I felt so incredibly privileged that I was taking this trip, I was also a bit anxious about it. One of the things that I made arrangements for was where I was staying in Israel and Lisbon . 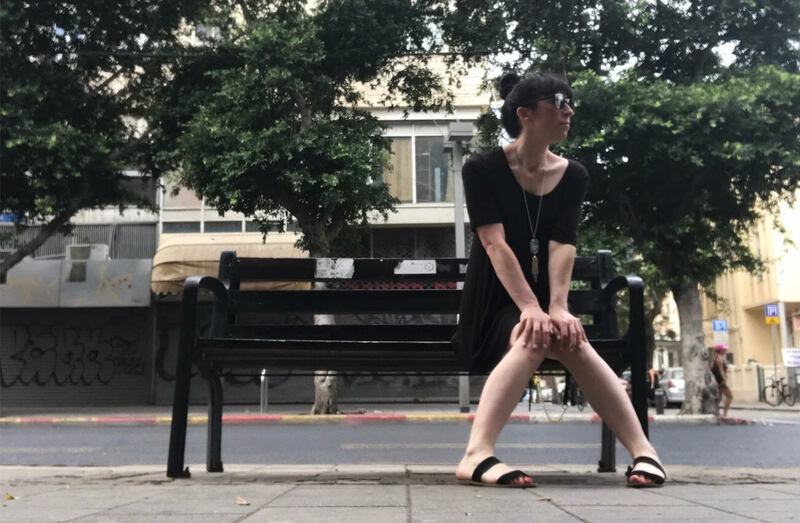 In Israel, I rented a quaint studio through Airbnb, in the heart of Tel Aviv and at a very reasonable price! Just in case you are interested, here is the link to Ronit’s profile. I also booked an Airbnb in Lisbon, but it wasn’t quite what I envisioned. Details about my stay in Lisbon in a later post. I also knew that I wanted to go to Jerusalem for a day and in Lisbon, I had 2 day trips planned, but the rest of the two weeks were completely unplanned, which is incredibly unorthodox for me. As most of you know, I usually plan everything in advance, whether I’m going out with a friend, planning a date, or organizing a vacation, but this trip I did the exact opposite of that. Typically, I always make sure that I have a jam packed schedule, and there isn’t any down time, and as a result, I often have a difficult time relaxing, sitting, and taking it all in, because I definitely suffer from FOMO. In a crazy way, it was really a challenge for me to just do whatever on a whim. So on this trip, I just did whatever, whenever, I wanted do it, and really tried not to put any pressure on myself that I absolutely HAD to do something. If I did it, great, if it didn’t work out, there is always a next time! And for the most part, I think I conquered this challenge. When I arrived in Israel, as usual, I immediately felt right at home. If any of you have ever been through the Ben Gurion Airport, you know that the passport control is quite the experience. It was what we say in Hebrew, a ‘balagan’, or crazy mess and incredibly disorderly. There were literally hundreds of people from all over the world, in disarray, just trying to get through passport control. As I waited there for over an hour listening to conversations in Spanish, Arabic, and Chinese, I finally got to the front of the line. My goal, since 2007, has been to get through questioning at the airport, in Hebrew. And it isn’t a simple, where are you from and what are you doing here? This year, I gave myself a solid B- for understanding and speaking with the guy. This is progress people! 🙂 When he finished questioning me, even with my american passport, he said, “welcome home!” and I literally became emotional. In that moment I felt so incredibly elated to just be there, in a place that I love so dearly, and I’ll say it again, I was home. Then, I hopped in a cab, practiced some of my sub-par Hebrew skills on the taxi driver, who then proceeded to practice some of his sub-par English skills with me, and headed towards my apartment. Tel Aviv is a vibrant, young, hip, city, with beautiful people, beaches, and amazing food. I know that when most people think of Israel, it isn’t always in the most positive light, but through my blog, I’m going to show you the side of Israel that you don’t always see, and I hope it will inspire you to hop on a plane and see it for yourself! Join me on my Israel journey, where I will be posting about all things Israel, what I love, what I don’t love so much, my best friends wedding, fashion, traveling, and FOOD!